In our family, this kootu is a must during Pongal festival. My mom adds some Brinjal (green coloured) to this kootu. But, I used to prepare only with Mochai. This is very easy and tasty preparation. 1. 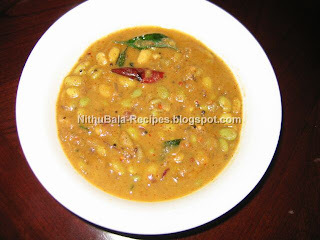 Cook mochai ( field bean) with a pinch of salt and keep aside. 2. Now in a pan, dry roast all other ingredients except turmeric powder. 3. Grind the roasted ingredients and turmeric powder. 4. In a pan, add oil and pop mustard. The add urad dhal and when it turns golden brown add the cooked mochai, salt and little water. 5. Now, add the spice powder. Medium the flame. Cook for another 15 minutes or till contents are thick enough. 6. Finally add curry leaves. Serve hot with rice.